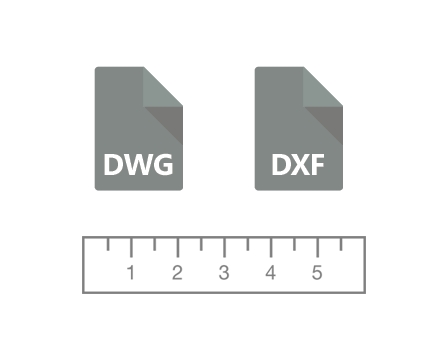 DXF and DWG are two popular file formats for professionals in the construction industry. Whether architects, designers or project managers, most of those involved in planning and erecting a building are familiar with these two extensions and with the software that creates them: Autocad — one of the most widely used computer-aided design program for drafting 2D and 3D building models. This entry was posted in Document conversion and tagged dwg, dxf, Grayscale on April 26, 2016 by reaconverter. AutoCAD is one of the most popular programs used by architects, engineers and other professionals in the design and construction industries for delivering computer-aided design and drafting. In case you are one of its users, you may have come across DXF (Drawing Interchange Format) files — a format introduced in the 1980s for increasing the interoperability of AutoCAD files. DXF files were meant to reproduce DWG files and had subsequent releases in the following years. In case you found or were sent a DXF file but do not have AutoCAD installed and you don’t know how to open it, conversion to PDF is the best option. It only takes a few clicks with reaConverter. This entry was posted in Document conversion and tagged autocad, cad, dxf, pdf on February 1, 2016 by reaconverter. If you are an architect or an engineer, you probably use AutoCAD a lot. This popular computer-aided design (CAD) software is also used by project managers, designers and several other professionals involved in designing and constructing buildings. Since its initial release in 1982, AutoCAD has launched a large number of subsequent upgraded versions throughout the years. Because of this, you may have encountered the situation where a DWG or DXF file — two of the extensions commonly used in association with AutoCAD — created with an older version of AutoCAD are not compatible with the current version you are using. This entry was posted in Image conversion and tagged autocad, cad, dwg, dxf on December 14, 2015 by reaconverter. JPEG is the most popular format for storing and sharing decent quality images or uploading them online. But in case you want to process a JPG file via a computer-aided design program such as AutoCAD, you will need to vectorize it. Or, in other words, turn it from a raster file made up of pixels — into a vector file made up of points, lines and curves. This entry was posted in Image conversion, Vector conversion and tagged autocad, dxf, jpeg, jpg, vectorization on October 12, 2015 by reaconverter.